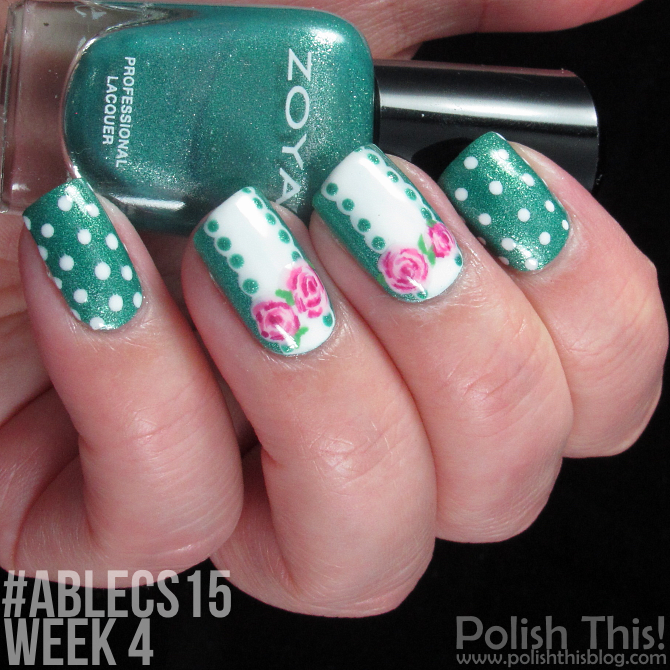 #ablecs15 Week 4: Turquoise - Polish This! I wanted to save my Sporting mani for little later, so I started week four if #ablecs15 challenge with the Turquoise theme. I thought this would be an easy theme since I looooove turquoise, but with only just a color as a theme there's so much you can do and frankly I was a bit lost with this one. Then I did a bit googling and came across with this beautiful Vintage Nail Art at Paulina's Passions. I pretty much copied Paulina's gorgeous manicure, I just changed couple of things as I wanted to do more than just one nail with the lace and rose design. So I did the lace and rose design on my middle and ring fingers and just some simple dots on my other nails. As the theme for this challenge was turquoise, I chose to use one of my favorite turquoises Zoya Zuza as my base color. I did two coats with it and then I painted the white sections on those two nails with OPI Angel with a Leadfoot. Then I used dotting tool to do the dots on my other nails with the same white OPI as well as the dotted line to those white sections. After that I dotted with a smaller dotting tool and Zuza over the white. Finally I painted the roses with a small nail art brush and using Essie Romper Room and Zoya Eden and Reagan, and the leaves with Essie Mojito Madness. I should really practice those roses more, mine aren't nearly as neat as Paulina's. Though then again, I'm not sure if I should even compare mine to hers as she is pretty much the flower nail art queen. At least mine do look something like roses and that's the important thing. I really like this vintage look and this manicure! This was so easy to do and I'm once again amazed how stunning Zuza looks! I only own a mini version of it, but since it's one of my favorite turquoises, I think I'm going to need to buy a full version of it. Which is your favorite turquoise polish? Iiiihanat kynnet, nuo ruusut on niin taidolla tehty! 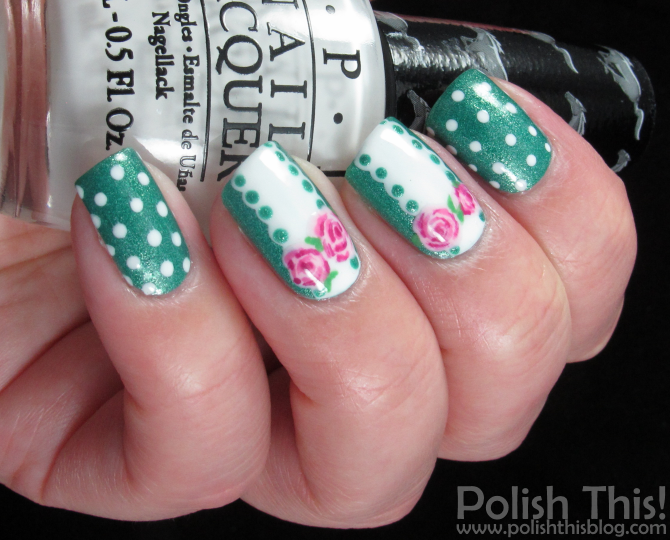 Zuza is such a fantastic color and I love how girly and sweet this mani is!